A deadly attack against am M16 team leaves Agent Marc Dane the only survivor— along with evidence framing him as the perpetrator. Forced to go on the run, Dane races against time to uncover the truth behind the attack and clear his name. With no one left to trust, Dane must rely on the elusive Rubicon Group and their highly skilled former U.S. Army operative Lucy Keyes. A terrorist attack is coming, one bigger and deadlier than has ever been seen before. With the eyes of the security establishment elsewhere, only Keyes and Dane can stop the attack before it’s too late. 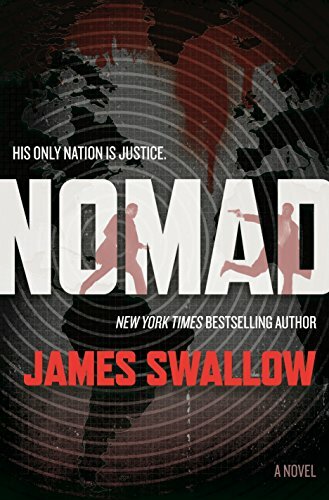 Fast paced and intensely gripping, Nomad takes the reader on a high-octane thrill ride from start to finish. British author James Swallow is a New York Times bestselling author and scriptwriter, a BAFTA nominee, and a former journalist. He is the award-winning writer of over 50 books that include the Sundowners series. His novel Nomad was first published in the U.K. in 2016 by Zaffre Books and was the opening installment in the Marc Dane series. This is Nomad’s first U.S. hard copy edition. Swallow unapologetically and capably follows in the hallowed footsteps of spy genre legends such as Ian Fleming, Robert Ludlum and Tom Clancy, all of whom clearly play a significant role in the creation of this must-read page-turner. Sharply developed and geo-politically current, the plotline does everything you’d expect from an espionage type novel. It draws heavily on the old-fashioned classics of the genre, and only veers into predictable terrain on a few occasions. Add in a striking depiction of the individual human cost that terrorism plays on modern society and you’ve got a formula for a slam dunk, no doubt bestseller.